Today I met the Cabinet Secretary(Government of India) and raised the issues pertaining to National Pension System(NPS), Minimum Wage and Fitment Formula, “Very Good” benchmark for MACPS and non-holding of meetings of the National Council(JCM). The Cabinet Secretary said that, he is aware of the problems of the Staff Side(JCM) from time to time and particularly to this issue and will definitely try to resolve them. Particularly on the issue of National Pension System(NPS) he said that, the issue is under active consideration of the Government of India and we are trying to find out some solution to the problems arisen because of the NPS. The above is for your information. Even today SENTIME NEWS confirm MF FACTOR 3 times.On some methodology unions reminded for3.71 MF to central govt but great deepawali on MF 3 itself. Good cheers on achievement by one and all. Minimum wages enhancement Rs. 24000/-pm is good news. 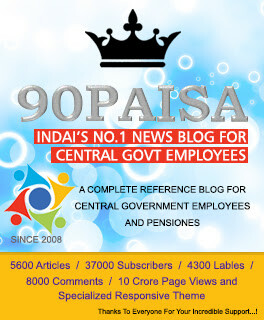 when can central govt employees will get. what is the date of effect for enhancement of minimum wages Rs. 24000/-. will applicable for other promotees also. please comment.